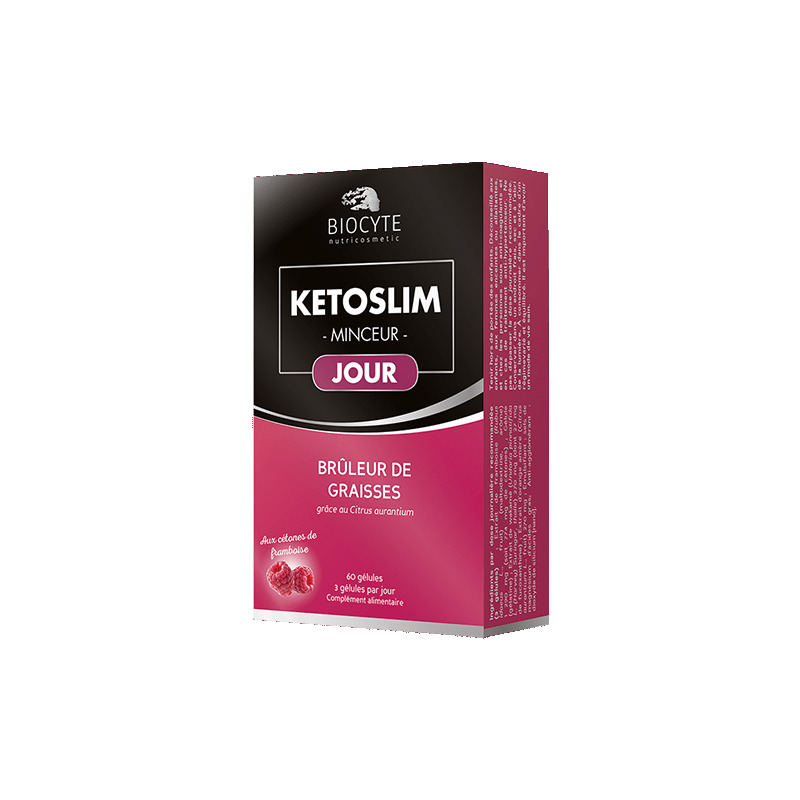 Biocyte Ketoslim Jour® contains a high concentration of raspberry ketones, an active ingredient known for its slimming action. It acts like a fat burner thanks to Citrus aurantium. Biocyte Kétoslim Jour® contains a major innovation on the slimming market: raspberry ketones. This food supplement acts like a fat burner thanks to Citrus aurantium, which helps with weight management, promotes fat breakdown and maintains healthy adipose tissue. Kétoslim Jour® is also formulated with wakame for improved weight management, appetite control and fat metabolism. Thanks to Kétoslim Jour®, fat is eliminated, the appetite is suppressed and weight is controlled. - WAKAME: Helps with weight management, appetite control and fat metabolism. Take 3 capsules per day during breakfast, with a large glass of water. Repeat intake based on need. - Individuals looking for a slimming aid to help control their weight and eliminate toxins. 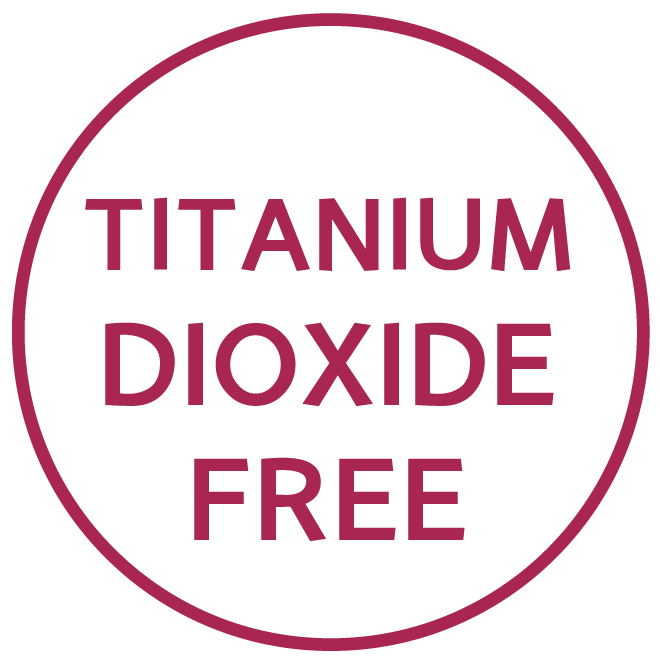 Food supplement based on Raspberry ketones, Citrus aurantium and Wakame extract. Keep away from children. Not recommended for children, pregnant or breast-feeding women and in case of hypertensive treatment. Do not exceed the recommended daily dose. Store in a cool, dry, well-ventilated area. Use as part of a diverse and wellbalanced diet. It is important to maintain a healthy lifestyle. 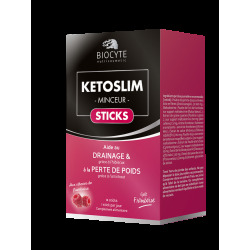 Biocyte Ketoslim Weight loss 5 in 1® traps fats, reduces calorie intake, regulates appetite and prevents snacking. Medical device. Biocyte Ketoslim ampoules® improves weight control and promotes the elimination of toxins thanks to guarana and chicory.Delicious rapsberry flavor. Water Detox Slimming is a drink mix powder with a delicious natural peach flavor which assists loss of weight thanks to chicory.